Patients' summarized medical history is a click away. Information on a patient's allergies and medical conditions is displayed in order of discovery and diagnosis dates. The patient's current list of doctors is also shown. Patients' basic vital information, including blood pressure, glucose, and cholesterol is displayed. They can select other health indicators and show them along with their vitals. The interface also provides links to educational material explaining the significance of each vital sign reported. MyHealthProfile provides a history of medications prescribed for patients. The information displayed includes the prescriber, when the medication was prescribed, and in what quantity. Patients have access to their history of medical procedures, including the procedure type, date, and result. Information on the approving party and the person who carried out the procedure is also included. 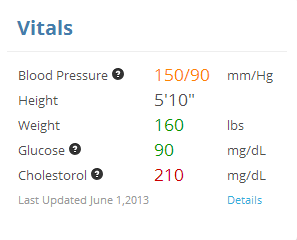 MyHealthProfile also coveniently displays a patient's lab results in an organized and easy to understand table.